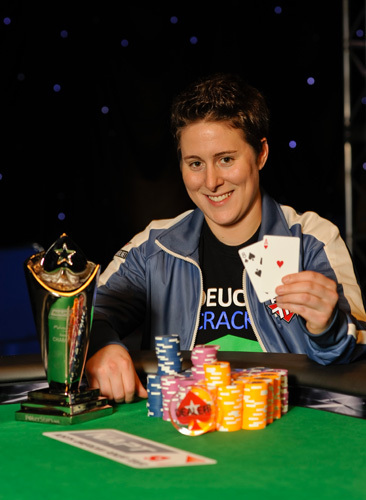 All Things Lesbian: Interview w/ Vanessa Selbst: The #1 Female Poker Player of ALL TIME! Interview w/ Vanessa Selbst: The #1 Female Poker Player of ALL TIME! Maybe you haven't heard of Vanessa Selbst. Maybe you have. Did you know she's the number 1 female poker player of all time and she just so happens to be a gay lady? Check out our interview right here! All Things Lesbian: What got you into poker? 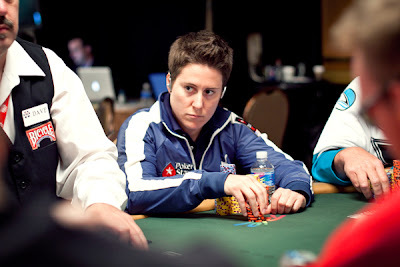 Vanessa Selbst: I grew up playing games; my family is big into games that use logic and deductive reasoning. In fact, my parents actually met playing bridge, so I guess you could say it’s in my DNA. I started playing poker about 9 years ago, just messing around with friends at college. I then learned about online poker and online poker forums, got serious about the game, and starting building my bankroll in cash games. In 2006, I played my first couple of tournaments and made my first televised final table at the World Series Of Poker. From that point, I was hooked. more women to get involved in poker as it's often considered a "man's game"? VS: Poker is still seen as a man’s game because it’s mostly played by men. For a host of reasons, relatively few women try their hand at poker. Society has different expectations for women and women are not usually socialized to be aggressive, competitive, mathematical, and risk-taking. With that said, more and more women are playing all the time, and I think that poker, as an industry, is taking initiative in making the poker room a more welcoming place for women. From a PokerStars Women online presence to the World Series of Poker hosting a Ladies Tournament, an effort is being made to bring women into the game. On a strictly selfish level, women should play poker because it’s a really fun way to make a living, but on a political level, it’s messing with the status quo. The only way to make it less of a “man’s game” is to increase the presence of and the visibility of female players. VS: The sad truth is that when you’re playing poker every day, you don’t get to see much of the city you’re in. I try to make a real effort to get out and see some of the sights, even if it means arriving a day or two early. Barcelona is one of my favourite cities in the world, so it’s always a fun stop. I enjoy London a lot. Melbourne is a beautiful city. The waterslides at Atlantis in the Bahamas are a must do. I recently played a Latin American Poker Tour stop in Lima, Peru and loved the people, the food, and the scenery. involved with LGBT activities like that one? VS: Poker consumes a lot of time, but I still feel a devotion to LGBT causes. My partner and I are getting married in August, and decided to “register” for charitable donations in lieu of gifts. One of the non-profits we chose is the Hetrick-Martin Institute, a New York City-based organization that provides a host of resources for LGBT youth. I’m also in talks with some folks about potentially hosting (or co-hosting) a charity poker tournament to benefit an LGBT organization. ATL: Who keeps you inspired (both poker-wise and in terms of LGBT visibility)? VS: I don’t know if it’s a “who” as much as it’s a “what.” I am really inspired by the shifting societal attitudes about the queer community and LGBT rights. As I write this, the Supreme Court is hearing arguments on proposition 8 and the Defense of Marriage Act. It’s so exciting to be part of a truly pivotal time for the LGBT community. ATL: Do you have any upcoming events we should know about? VS: I’m spending the spring traveling for poker—Florida, Berlin, and Monte Carlo. The early part of the summer will be spent in Las Vegas for the World Series of Poker, and then it’s back to New York to get ready for my August wedding! After that, it’s anyone’s guess. The future is full of possibilities. New Dinah Addition: Leah Labelle! Winter Heat: The Hottest Women's Party in NYC! Why is the word "lesbian" left out of text books? An Interview w/ Jill Bennett!